The Alternative to nuclear power is here NOW! NO need for new nuclear plants! 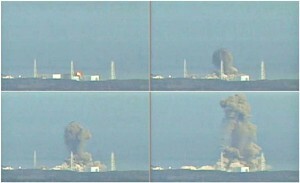 I have been blogging against new nuclear power for some time. One of the comments made regularly about nuclear power is that it provides constant reliable power. Now there is a renewable technology that can provide constant reliable power too! Forever! And it is Green! Wave energy to replace nuclear power, Now! There are many wave energy generator systems now. The European Marine Energy Centre (EMEC) Ltd is the first and only centre of its kind in the world to provide developers of both wave and tidal energy converters – technologies that generate electricity by harnessing the power of waves and tidal streams – with purpose-built, accredited open-sea testing facilities. Carnegie Wave Energy Limited is the ASX-listed inventor, owner and developer of the patented CETO wave energy technology that converts ocean swell into zero-emission renewable power and desalinated freshwater. Wave Hub is the world’s largest and most technologically advanced site for the testing and development of offshore renewable energy technology. Located 16km offshore in the eastern extremes of the Atlantic Ocean Wave Hub offers four berths for testing offshore renewable energy technology. Purpose built, pre-installed, grid connected infrastructure is provided with a 30MW export capacity, upgradable to 48MW. With a fully consented site and a 25 year lease The Wave Hub offers water depths ranging from 48m – 58m, one of the best wave climates in Europe, and wave climate monitoring. A full range of baseline data along with proximity to a variety of ports and associated facilities are available. Access to expert academic institutions specializing in offshore renewables, access to funding support, and a dedicated operational team enhances options. So there are alternatives to nuclear power available NOW! This is the basic message that eisforenergy.org and my book are making all the time. Why do I want wave energy systems over nuclear? Because it is available now! Because if it fails it may sink to the ocean floor, or drift into shore, or get hit by a ship. 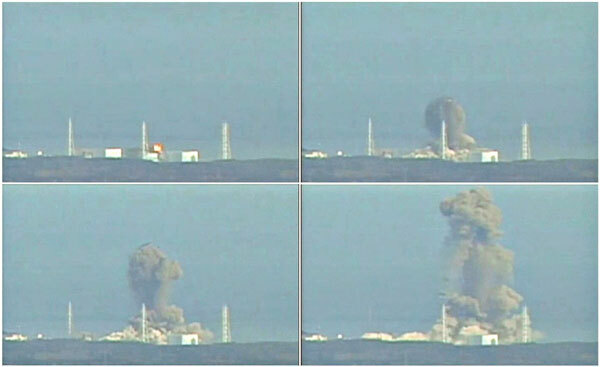 When a nuclear plant fails there is radiation poisoning for a thousand years. DECC is working on plans to build 80 New nuclear plants in this country. I don’t want any new nuclear plants here or anywhere. We do not need them. The future of the UK, Europe and the planet depends on YOU and ME forcing our governments to change their ways. You need to write to your member of parliament and tell them that you prefer wave energy over nuclear energy. Write to you MP now! All you have to do is search for your representative using google. Then send them a simple statement about how you feel. I will be here with all the information you need to get the message across. Ownership is democracy here in the UK or anywhere. Who owns the electricity generation plants in the UK? You don’t own them. Major energy companies own them. What effect does this have on the democratic way of life we expect to enjoy? Video #6 looks at the relationship between the owners of energy production and the power to influence the political process. EDF is working hard to remove democracy from the power industry. 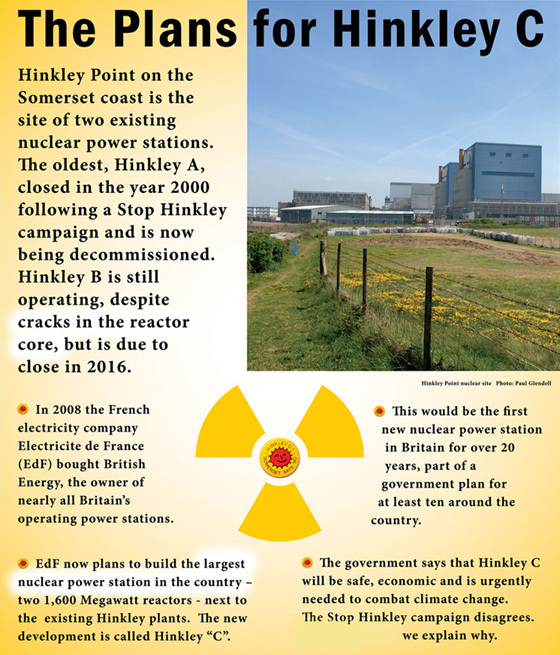 In 2012 EDF filed a petition with the High Courts to block any protest against the construction of Hinkley C, or other new nuclear build projects. This is undemocratic and illegal under EU laws on human rights. This is the face of corporate ownership of energy. This move by EDF created a protest movement to force the courts to allow protests about new nuclear plants. A protest to allow future protests! We really have to work to keep democracy alive! Or we could own the power itself! It is actions like this, by the greedy power companies, that are undermining democracy of this country. When we can produce our own energy using community power schemes and roof top solar systems WE own the power of production and control of our government. The only way to achieve this is to take back public ownership of the National Grid and the gas and electricity supply. 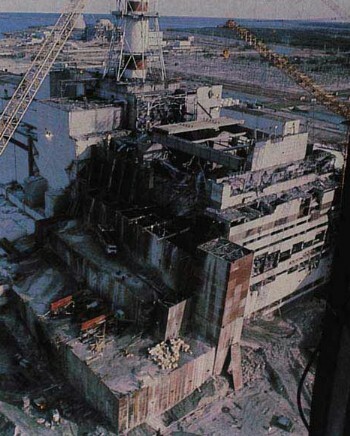 In a previous blog post I exposed the work being done by this government behind closed doors to get Russia to build new nuclear plants in our country. How many of YOU would allow a oligarch like Putin, who has just annexed the Crimea using troops and propaganda, to build nuclear plants here in the UK? I don’t understand how we can complain about the lack of freedom and democracy in China and Russia and then try to sign deals with these countries to build nuclear plants on our soil. Do you want Russia to build a new nuclear plant here in your back yard? I do not! You can have your say today by writing to your local and national representatives. Write to your MP now! See the next video interview. Guardian article Tuesday 11 March, while Russian troops invade Crimea our government will invite Russians to build nuclear plants in the UK! DECC at Edinburgh Uni lecture says..
Haye chairs a UK-Russian working group on nuclear power, and was in Russia recently for discussions. Haye regards the Russian VVER reactor proposed for the UK as “perfectly safe”, but he cautioned that there would be problems convincing the public that a deal with Russia was acceptable, especially given the current crisis in the Crimea. “It’s a long road, a very long road,” he said. Hergen Haye, head of new nuclear development at the Department of Energy and Climate Change (DECC), told students at Edinburgh University that active discussions were taking place in London after a memorandum of understanding had been signed with Russia. Tell David Cameron that you don’t want Russians building nuclear plants in our country! alphabetrevolution Energy Companies, NO HINKLEY C, Nuclear Disaster, Special Days Comments Off on UK government and DECC have gone totally mad! What’s really going on with the European Pressurised Reactor construction in Europe? AREVA, the majority French state-owned nuclear giant, has called a halt to the grindingly slow construction of the EPR reactor in Finland.The project, which is already 5 years late and €7,508,209,000 over budget, has been plagued with problems not least of all the as yet unresolved control and instrumentation problems. AREVA can’t give completion date, and after delaying their completion date early last year to 2016, Finnish newspapers are now citing 2018 as the earliest the reactors could be completed. Stop Hinkley spokeswoman Nikki Clark said today “These claims and counterclaims conceal a much more fundamental problem still causing delays to the EPR reactors in Finland & France, one which will no doubt be the cause of delays & cost over-runs here in the UK if the British government insist on going ahead with Hinkley Point C. The EPR reactors have been plagued with technical problems unique to generation 3 reactors. The current British fleet of reactors are analogue reactors whilst the proposed generation 3 EPRs are digital, well on paper at least they are. It seems AREVA/EDF are discovering that the differences between theory and practice are greater in practice than in theory. Greenpeace report cites open door to hacking nuclear plant controls! In a report produced for Greenpeace in 2010 about the problems with the EPR I&C the authors stated that the digital control systems provide “new possibilities and capabilities can be used in both beneficial and malicious ways…the same mechanisms that allow for greater diagnostic possibilities, and for remote monitoring, controlling and updating, can be potentially exploited by cyber-attacks, as shown by the recent Stuxnet computer virus that targets Simantic programmable logic devices, a kind of industrial computers by Siemens. In 2010, when Greenpeace produced their report on the I&C problems with EPRs, little was really known about STUXNET as the attack was still fairly recent. However, the American magazine Foreign Policy revealed last year that STUXNET had a secret twin – a far more sophisticated older variant of STUXNET. Between them, the two STUXNET variants have demonstrated the ease with which critical infrastructure can be targeted as many of the systems for operating infrastructure, from nuclear power plants to chemical factories, are standardised – the Nanantz uranium enrichment facility was controlled by Siemens S7-417 industrial controllers. alphabetrevolution Energy Companies, NO HINKLEY C, Nuclear Disaster Comments Off on What’s really going on with the European Pressurised Reactor construction in Europe? Owning our power is the key to our energy security. Owning the means to produce our energy means that we can never be held ransom by anyone person or country. Video #5 is all about energy security. 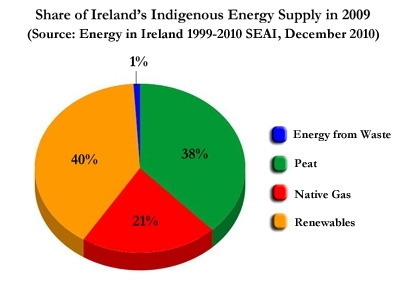 Should we be selling our energy production to foreign countries? OR, in a rapidly changing world should we be owning our electricity generation systems? Will buying back all UK energy production and energy grids help us remain independent of other countries? Can public ownership of our energy services give us the power to chose renewable energy? David Cameron recently initiated a proposal to build a new nuclear power plant at Hinkley in Somerset. The funding for building this new plant will come from the Chinese. British citizens will provide the tax money to underwrite this boondoggle. 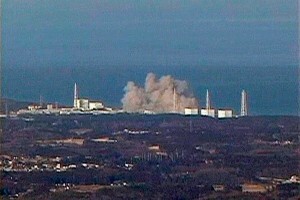 EDF is supposed to build and operate this new nuclear plant. The Chinese and EDF had to be bribed with promises of twice the current rate of payment for nuclear electricity. We currently pay £45 per Megawatt hour. the EDF and the Chinese investors will get £92.50 per Megawatt hour. UK and Europe are opposed to nuclear power. Fortunately there are many people in the UK and in Europe that disagree with this proposal. In the UK we have many groups and organizations working to end any thoughts about building new nuclear plants. There were 1750 accidents, mishaps or leaks at UK nuclear plants between 2002-2009. Here is just one good reason why. 1750! This is no random number. This is the number of accidents mishaps and leaks at UK nuclear power plants from 2002-2009. The scale of safety problems inside Britain’s nuclear power stations has been revealed for the first time in a secret report obtained by the Observer that shows more than 1,750 leaks, breakdowns or other “events” over the past seven years. British public will underwrite 16bil plant construction cost. Energy security or indentured servitude? The European Union in Brussels is questioning the UK government promise to underwrite the £16bil. cost of the new plant at Hinkley. This is not energy security. this is an energy crisis that will lead to greater insecurity of our means of generating electricity. Write to you MP now!. 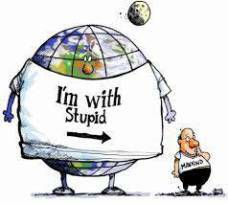 Tell them to stop being stupid and start building the renewable energy future we need today. Watch the next video interview. Cameron has said that he will provide compensation to Somerset for having a new nuclear plant in their community. A £128 million deal to “compensate” Somerset for hosting the proposed new Hinkley C power station is “a drop in the ocean” according to local campaigners. Stop Hinkley spokesperson Theo Simon said, “This deal, which breaks down to only £3 million a year going to local councils for the next 40 years, is no compensation at all. If EDF get their way in the current price negotiations with the government, we will all be paying a massive extra nuclear tariff on our electricity bills over the same period, and our taxes will be underwriting the whole project by literally billions. “No one can criticise our councillors for squeezing more money out of central government, but the amounts need to be put in the wider context. Somerset County council has seen budget cuts of £20 million this year under the Tories “austerity” programme and this is hitting the vulnerable and low paid across the whole of the county. 3 million is really not very much in the overall budget – the County’s capital investment programme alone is £38 million. Write to your MP now to stop this madness. Stop Hinkley is dedicated to the decommissioning of all the nuclear reactors on the Bristol Channel and the Severn Estuary and is committed to the introduction of greener technologies more appropriate to this millennium. 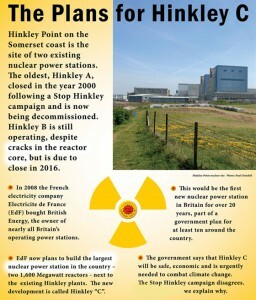 Stop Hinkley started life in the mid-eighties as ‘Stop Hinkley Expansion’ (SHE). As the name suggests, the goal was to ward off the government plan to build a new Pressurised Water Reactor known as Hinkley C.
I have already covered the Stop Hinkley movement. Working to stop new nuclear power in the UK is vital to our renewable future. You have the videos to watch via these links to the original blog posts: video 1, video 2, video 3, video 4. France banned fracking! UK needs to ban fracking also? Fracking has been covered here too. France has BANNED fracking forever because the French people care for their environment. We need to stop fracking in the UK for the same reasons. 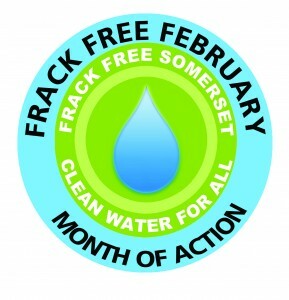 Frack Free February is a Month of Action in Somerset with public meetings, talks, stalls, workshops, actions and more all raising awareness about the threats to our communities and the bigger picture of extreme energy. Stop Hinkley C and Frack Free Somerset are holding a few meetings you need to know about: Radiation Risks of Fracking and Nuclear Waste. 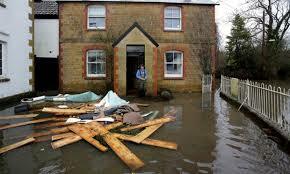 David Cameron is again playing to the media when he promises to spend what ever it takes to mend flood damage. What this really means is that it will be business as usual for ‘the Greenest government ever.’ Cameron will continue to help out his friends in the oil and gas industry. There will be no end to the insanity and financial ruin which up to 50 new power plants will create. You and I will be stuck with hundreds of tons of nuclear waste: we have no place to store this waste and the cost of keeping it safe now is always going up. We will suffer the environmental harm caused by Cameron’s friends in the fracking industry. Please write to your representative. What if there is an accident at Hinkley C? What if there was an accident at Hinkley C? What if the accident at hinkley C was like the ones at Fukushima or Chernobyl? 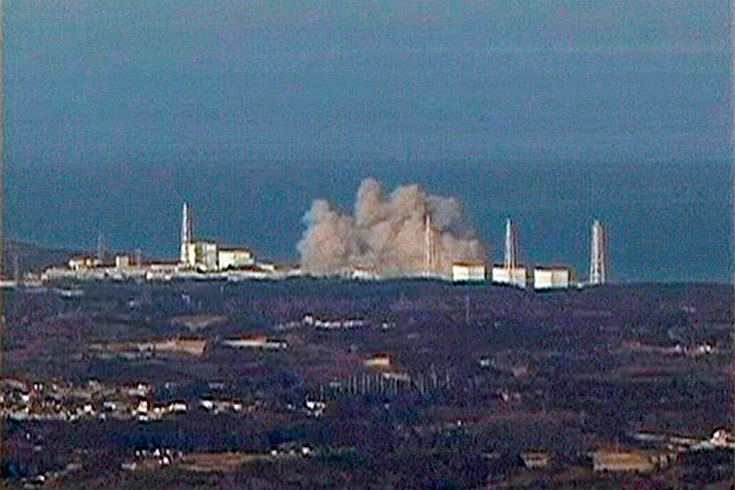 A nuclear accident at the coast of Somerset would end the lifestyles of millions of British citizens. 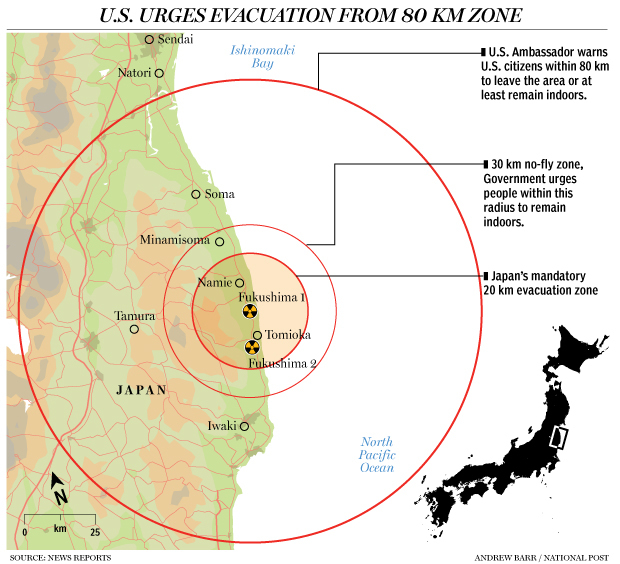 Every major and minor city within the radiation zone would have to be evacuated. Like Fukushima where an exclusion zone of 80Km was recommended. What if we have to evacuate Bristol and Cardiff? Accident at hinkley C = No More Glastonbury! We could never have a Glastonbury festival ever again! Every city West of Salisbury to the Atlantic coast would have to be evacuated. Every city South of Pontypool to the channel coast would have to be evacuated. We have discussed the financial disaster that new nuclear power would create. We have discussed the lack of need for new nuclear power. We have discussed the waste from nuclear power which we STILL have no place to store safely. Now we discuss the possibility of an accident at the proposed new nuclear power plant at Hinkley. Here is the link to video #4 in my series of interviews. We the people can make the right choice if we have all the facts. With the truth we can make an informed decision about what direction our energy policy should take. We don’t know all the facts. The energy companies are keeping the truth from us. We must learn the truth. The truth will set us free and end nuclear power in the UK forever. Watch the next video interview here.